Working on a layout today (I KNOW! unbelievable!) and did something that helped me with one of my weird fixations – I don’t stamp often on layouts because I am not a very competent stamper and I wouldn’t risk stamping onto an actual layout if I could avoid it, unless I had a plan for later covering it up when I botched it. 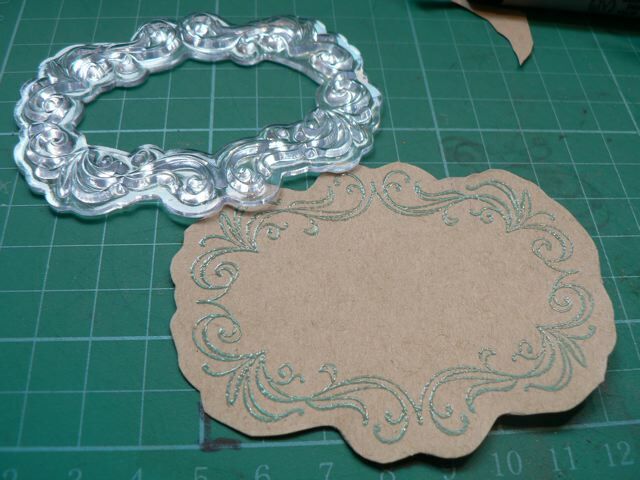 So I tend to stamp on some bit of paper or card then cut it out and put that on the layout. MUCH safer! But it annoys the life out of me that I always start well, cutting just the right amount of a border, following the stamped lines, then at some point it all goes horribly wrong. I try to correct, but in the end more often then I care to admit I just throw the stamped thing in the bin and do something else! This may be only helpful to those who are as cack-handed at cutting a symmetrical border around them. I stamped a couple of lovely little journaling frame (Inkadinkadoo) onto kraft card to cut out, and while taking a deep breath and collecting myself to begin cutting, my eye landed on the acetate that the stamp was stored on. Hum. A little printed frame, with a sort of semi-cut border around it. I put down the scissors and had a think. I didn’t really want to to cut up the storage sheet, although I certainly could have to get the same “tool”, so I grabbed a bit of acetate from the shelf. Looking at the stamp I could see the stamp itself provided the border. I figured the stamp makers know what they are doing. The edges of the stamp are precisely placed, and frame the stamp perfectly so why not make use of that?? Flipping the stamp over onto the acetate I simply traced around the edge of the stamp. I also traced inside the stamp, because I could envision using the cut out as a mask to, for example, spray glimmer mist or ink or chalk inside the stamped image, just where I would write or stamp the text. 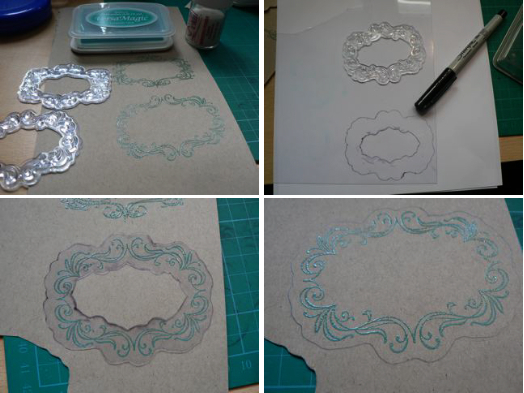 I cut it out of the acetate with a craft knife on my very old CM glass cutting mat. I laid that over the stamped image and traced around the outside and cut that. I do think maybe a bit of glimmer mist in the middle would be a nice touch (not for this layout, but someday) so I will def. do this again. Even for things like annoying little butterfly antennae, it would take the guess-work out of where to cut, and for me that is a huge benefit! Categories: Layouts, stamping | Tags: Layouts, technology & scrapping, tips | Permalink. Have you tried the fiskars clear acrylic stamper. It has sponge feet and when you press down it stops you going to far and smudding the design.